Monday – I would be updating if I were catching any fish. The weather is great – a tad windy- but certainly fishable. The water is clean – a tad choppy- but certainly fishable. Lots of sand fleas and frozen shiners so bait is not a problem. No fish. 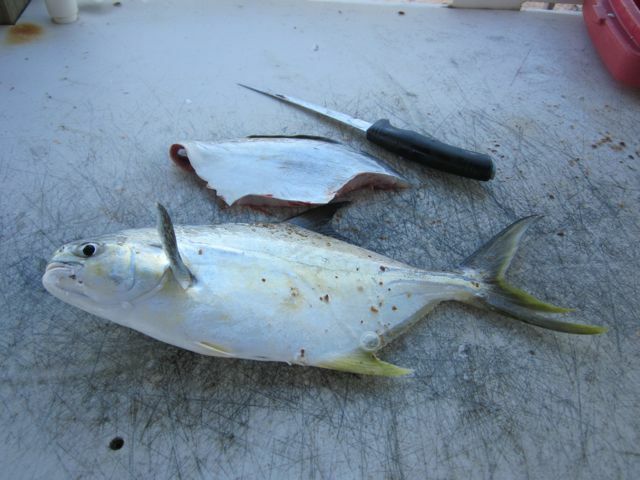 I did manage to snag one small pompano which I promptly converted into fillets. I’m so desperate that I actually took a picture of it. Wed – finally some fish. They started biting late yesterday. Not a big bite but compared to the rest of the week, a welcome relief. I got another pompano and a few whiting. It came late in the afternoon, high tide, and with a rain threatening sky. Personally, I enjoy just fishing in the surf so much that actually catching something is a bonus. The folks staying upstairs wanted the fish for an end of week fish fry so I made the contribution. For the next two days I’m expecting good things with the high tides happening closer to sundown. That’s my favorite combination. Nancy is enjoying the trip as well. She was set up to play bridge Tuesday and Thursday in Palm Coast. The game there is an afternoon game so it fits well – I hit the beach early then we take a break late morning for breakfast. I come back to the beach while she heads off to the game and returns late afternoon. We hit happy hour at the pier or whatever hits the spot and home before dark. On Tuesday she was asked to play in a Swiss Doubles game (not sure exactly what that is) Wednesday so she’s an extra happy camper. Tonight is fish and chips night at the Golden Lion so the pier will have to wait a day. Wood chip update – I’m 3/4 through one load and it looks like I’ll have all the places I’d intended to cover done with that one load; and just loafing along, I should have it done before Thanksgiving. I could have it finished in one day but I’m waiting for a bottom layer of cut palmetto fronds to get fully dry before covering with wood chips. If I don’t do that, the area will sag later and require more fill and since there are no planned social events at the lake, why rush it. This morning I heard some banging up by the road and when I checked there was another new pile of chips; so I now have two full loads and 1/4 of the first load available. We told them they could dump as much as they wanted but perhaps that was a mistake. I had in mind one big load or perhaps two. This time of the year my work hours change. In mid summer I’m out doing the garden or the jungle by 8 AM and quit by 11AM; now I’m 9 till noon; by Dec that will be 10 till 2. No change in wardrobe because I wear long pants and a long sleeve shirt even at the peak of the summer but now it feels comfortable. If I dress down in the summer to shorts and no sleeve T’s, the jungle bugs and sharp brush tear me up. In mid winter I switch to lined jeans and add an outer vest. This week is beach week. I’m blasting out this post and then will start packing the car. If everything is on schedule by 2 PM my bait will be in the surf. It’s less than an hour from the house but the beach is a totally different environment. We’ve rented the same place, twice a year, for the past 5 years and it fits our needs and likes perfectly. I’ve been loading up with large shiners for bluefish bait so I’m ready. It’s looking like the weather will be nearly perfect, low 80’s and sunny during the day, low 60’s at night. Nancy is set up for two or three rounds of bridge at the Palm Coast club and will have enough quilting backlogged to relax at that. We have several favorite restaurants and no firm schedules – depends on the tides and what’s biting in the surf. Get ready for some nice fish pics. So now that the Obuma administration has turned off all our Middle East allies, it’s going to work to do the same in Europe. Off to a great start, I’d say. Not too much going on in the garden. The green beans are pickable and loaded with beans and blossoms. We’ll be picking these for at least a month, longer if we keep picking continuously. The late season cucumbers are done and all we got was half a dozen and those were not nearly as good as the spring grown ones. A couple of the tomato plants have blossoms and should have fruit before Thanksgiving. There are four acorn squash plants with plenty of squash attached. No telling how they’ll work out – depends on whether critters get them. We’re being promised a cold snap by the end of the week and that sometimes marks the end of the bug issues. I’ve transplanted starts of kale, cabbage, broccoli, collards, and cauliflower into the garden and planted new seeds for lettuce, chard, and Chinese cabbage. That’s the fourth cabbage variety planned for this year. The seeds stay in the house until they germinate, then get transferred to a flat and eventually to the garden. I also put in a 20’ row of green pea seeds. This is the second time on the peas. The first planting a month ago didn’t germinate at all, I’m thinking because it was just too hot. I have high hopes for all the new transplants and the peas because we had an inch of rain last night and could repeat that for the next two nights. The rain is the leading edge of the cold snap. I’ve been mentioning the view area I cut through the jungle so we can see the lake from the living room. We can sit at the computer and check out the lake. That is until about 5 minutes ago. I was sitting at the computer and a giant branch from one of the dead bay trees broke off and landed perfectly to kill the view. It’s not windy and I didn’t see any crows landing or squirrels climbing out on the limb but it sure came down. If I had been standing there, I’d be dead meat. I’m just not going to mess with it today but it’ll take a couple hours with the chain saw tomorrow to restore the view. The dead tree is on our property for sure but it was overhanging the neighbor’s yard and that’s where it landed. This neighbor is a young guy renting the place and I know that branch could sit there for 100 years and he’d never clear it. I also know he couldn’t care less if I trespass and clear it myself. I also know the Home Owner’s Association (that would be me and George) doesn’t care one way or the other and would be perfectly happy letting it rot away over the next decade. I mentioned that I was landscaping our park by moving jungle flora from place to place. Most of the plants are bromiliads. If you don’t know what a bromiliad is, they’re the tropical looking plants with cactus like foliage and plastic looking exotic blooms you see in big box stores. They’re air plants which means they don’t develop underground root structures but rather get their nourishment from above – leaves, water etc. 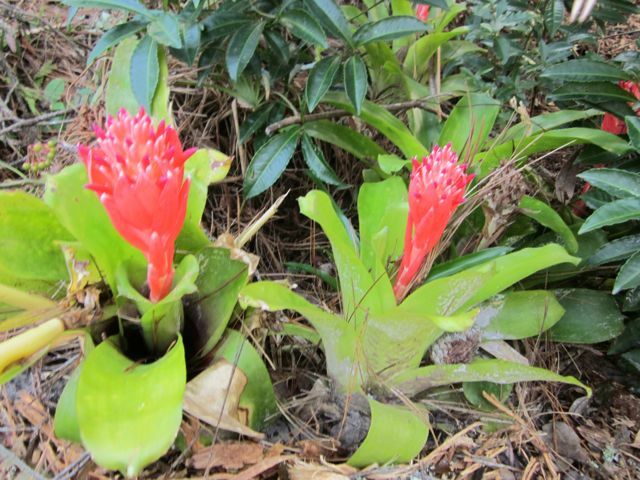 Similar to orchids, you can set them in the crooks of trees, hollowed out tree trunks or in between exposed tree roots. They do quite well in the jungle because so many nutrients fall onto them and the sunlight is well filtered. Over the years I’ve bought some and traded some with friends so I have a fairly good variety. The way they propagate is to send out shoots along the bottom of the plant which turn into new plants so if you just leave them be, they’ll form a clump of individual but connected plants. You can break off the new plants and relocate or trade off as you want. So when I was doing the jungle landscaping, it was breaking off plants from large clumps and moving them to newly cleared areas. 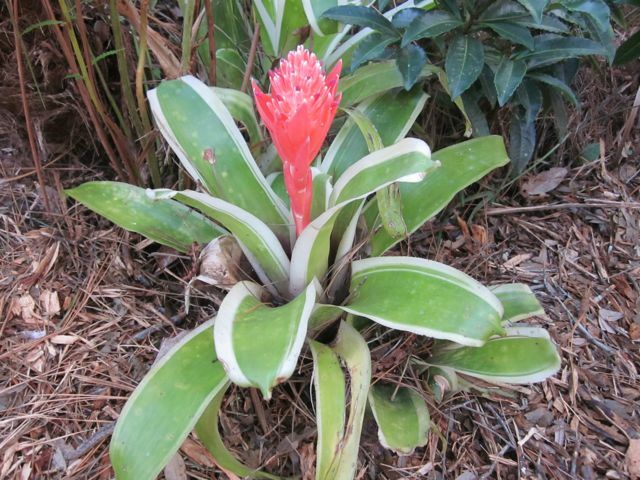 Now here’s the interesting part – each of the new plants is putting out a bloom. Usually you get one or maybe two blooms a year but apparently when you break off a new plant from the main clump, the new plant very quickly puts out a bloom – within a week of separation. I counted a dozen today walking down towards the lake. Here’s a few pic’s. I was down working on the dock and heard some clanging and banging up towards the top of the property. By the time I got up there to see what was going on, the tree trimmers had dumped another load of wood chips. I now have enough for two lifetimes. The picture shows just the new pile so double that to get an idea of the total. To add some perspective, the pile is 22’ long x 10’ wide by 4’ high – about 30 cubic yards. The pile at George’s is now three loads so between us we have over 150 yards of chipped trees and brush. It will decompose over time but I’ll be able to redo the paths annually for the next 10 years at least. I mentioned that I’ve been using the chips to clean up some of the jungle area, particularly areas along the path that look snaky. I never really see any snakes there but visitors walking by just know they could be attacked at any time. Today I saw three snakes – that’s three more than I’ve seen in the past six months. They were the harmless varieties, two black snakes and a corn snake, which is good news since they mostly feed on rodents. I have to guess that all the changes I’m making are putting them on the move. We had a big night on Friday. It was senior night at Lake Mary High – that’s senior as in high school senior, not a senior citizen event. It’s a big night with a football game and a ceremony that recognizes individual seniors associated with the football program. Olivia is a 4 year cheerleader so was among those recognized. Each of the honorees is escorted across the field by their parents so we got to see Tom, Tina and Simon walk with Olivia. Then the game and a chance to watch Olivia do her cheering. It must have worked because they did win the game. One thing I found interesting is that the lake Mary High cheerleaders outnumbered the football players – that would be the football players on both teams combined. I’ve been lots of speculation and opinions about who ultimate won and lost in the budget and debt limit wrangling and gov’t shut down. I haven’t heard anyone hit it right. The big, big winner is Christy. He’s a shoe in for Pres in 2016. He’s basically non-partisan and has forever worked in politcally divided gov’t and gotten good results. Starting another repair project – replacing a couple of rotting planks on the dock. I broke out the tools I thought I’d need and noted that my drill and rotary saw were both purchased from Montgomery Ward for my first remodeling job in 1970. Wonder what I do for a warranty if needed? Replacing planks sounds easy enough but the problem is that the screws holding down the planks have not lived up to their lifetime warranty so when you go to unscrew them, more often than not they break off. I attacked the first plank and managed to get it removed without too much trouble. The second one was a bit more challenging; not one screw backed out properly. As soon as I put the screw driver on them, the heads spun off. There are no really bad planks left but I’ll still pick up a couple more replacement since it’s looking like I can do the job myself as needed and not have to bother Mark. He replaced a couple a few months back so I think I understand what needs to be done and have all the (old) tools I need. Today was a major bulk delivery date – I got another 20 yds of wood chips dumped up near the road and George got 20 yds of fill dirt. He asked if he could have it dumped on my property and I was more than happy to oblige. We usually both work from the same piles and don’t get too engaged about ownership. For me, this puts dirt and chips much closer to where I’ll use them, which is a big deal. This pile of chips is about 500’ closer to the spread points than the other load which makes a large difference at the end of the day. My plan is to dump 5 wheel barrow loads, a couple of yards, each day filling in low spots in the jungle alongside the path. Gradually the foreboding jungle look just off the path is starting to take on a “park” look. I want it to look totally natural but not threatening to city folk. I was drafted by Nancy to thread the needles for one of her sewing machines. This is a monster machine called a serger (maybe it’s surger) with 4 large spools of threads going at one time. The thread paths are almost impossible to follow and requires going thru tiny holes, wrapping around posts, through tiny tubes and finally through the tiniest hole in a needle. Each thread has it’s own pathway but it’s very easy to cross paths such that the thread can be misrouted with disastrous results. We used flashlights, magnifying glasses, special tweezers, and scissors and had to give up in frustration a couple of times. Finally it looked like we had it threaded correctly and it broke a needle. It was an important sewing project so we persisted and eventually got it – on the second day. Personally I would have thrown the machine in the trash or taken one more tool to it – a hammer. It’s 30+ years old but the service guy said it was much, much better than newer machines and not to think about going to a newer model with automatic threading. We had a bit of a scare the other day when Tom called and said that Simon had crashed his bicycle and was in the emergency room at Shands in Gainesville. Simon has a job at a sub shop delivering sandwiches. It wasn’t clear exactly what had happened since he suffered a concussion and had no memory of the event. Luckily he was wearing a helmet so it could have been much worse. His face was scraped up and cut a bit but nothing that will be long lasting. As it is, he’s back home recuperating and will hopefully be back in Gainesville soon. While Tom was telling me what had happened my head moved back 15 years to another crash incident with Simon. I had taken him and Tommy on a camping trip and while I was setting up the camper, they broke out their brand new scooters and went up a short distance to the campground manager to pay for our spot. I kept my eye on them to make sure all was well and saw that on the downhill trip back to the camper, Simon was passing Tommy and picking up speed. In just a few seconds he was really moving fast and I knew he was out of control and would never be able to stop or make the turn he was heading for. Sure enough he crashed and slid, face down, along the asphalt road until he hit a concrete curb. He was a mess. We were about 15 minutes from an emergency room – that would be 15 high speed minutes. I knew he hadn’t broken anything, was completely coherent and talking to us about the ride but his face was a mess with lots of blood. They cleaned and stitched him up while I called Tom to break the news and get insurance info. He wanted to stay and continue our planned one week camping trip but I knew he’d be a sore pup when the pain meds they gave him wore off and headed back home, a 3 hour trip. We stopped for a shake at our favorite shake shop where he was applauded by a motor cycle gang then on to return him to Tina. She and half the neighborhood ladies were waiting on the doorstep when we arrived. I assured her all was well and made a quick exit. Tina posted some pictures on facebook that show his face after that accident alongside pictures of the current event. The big scrapes were on opposite sides of his face so nature balanced it out. 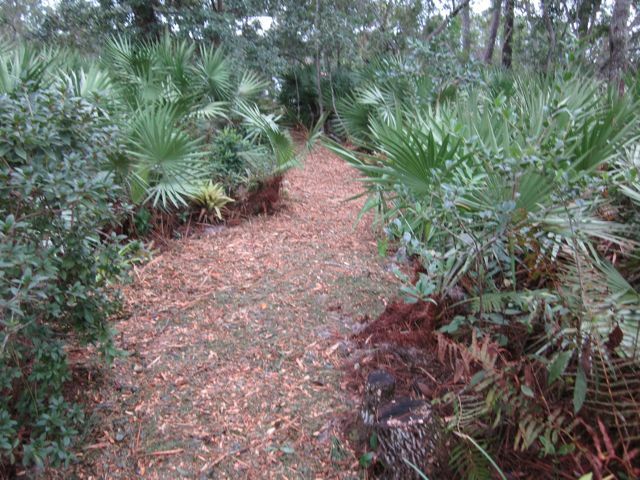 Finished moving the wood chips down onto the path to the lake and it really looks good. Like our own private park. About 5 years ago Tom bought me a garden wheelbarrow, large capacity with bicycle kind of tires, which is great for moving light mulch. From the chip pile to the path down by the lake is approximately 1000’ so each load I move represents nearly 0.4 miles, half with an empty wheel barrow and half with a full one. It took 13 loads to finish the job – you do the math. It’ll probably take about the same to do the other area I filled but I’m going to take off a day or two in between. With all that, I didn’t put much of a dent in the chip pile. The last time the power company did this much brush cleaning, we got a pile about half the size of this one and it lasted us several years. If we bought and had this much delivered, it would have cost as much as $500 so all in all, this has been a great week. I talked to the job supervisor and he’s going to drop another two loads on our property which will save me about 500’ per round trip. Turns out dumping here where they’re doing the trimming, is beneficial to them since otherwise they have to drive the load all the way to Deland, 15 miles. He said anytime we wanted more just to call. They’ll be working in the vicinity for the next several months. I’ve got plenty of areas where I can use the chips and with this infinite supply, I don’t have to dole them out sparingly. Also I can work at a slower pace. Now that all the hard labor is done, I switched to a job some may consider recreation. We’re going to the beach at the end of the month and I need to be sure that I have enough frozen shiners to use for Bluefish bait. It took about 20 minutes to bag half a dozen really large shiners. I already have a couple frozen earlier so that should do it. I’m soaking them in brine for 12 hours and then popping them in the freezer. The brine soak step is intended to toughen them up a bit since I noticed last time I used them that the surf beat the cut pieces up to the point where they didn’t hold up as well as mullet on the hook. A couple of the dead bay trees that were too far in the jungle to get to have started coming down on their own. We had a storm with a bit of wind yesterday and it knocked the tops off the trees and onto the pathway. I keep the chain saw at the ready and the path was cleared in about a half hour. You might be surprised to learn that it’s a rare week that goes by without me breaking it out. It’s only a small, 14” electric saw but it does a good job at limbing out trees where the branch diameter is under 6”. I’m pretty sure, or at least can speculate, that the deer in the neighborhood don’t have prostate problems. When I mention that I’m clipping palmettos, those are actually Saw Palmettos. 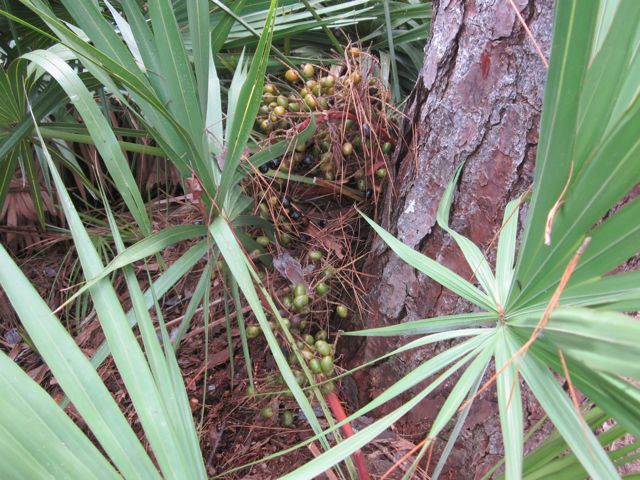 They’re called Saw palmetto because the stem has a very sharp, serrated edge and they cut like a saw blade. In the fall they put out a stalk of seeds/berries which start out green and turn black as they mature – the same size as kalamata olives. If you check the non-prescription area in your pharmacy you’ll find Saw Palmetto as a medication for enlarged prostate. What I didn’t realize is that the deer feed heavily on the berries. When I did the recent major clearing, I opened quite a few palmetto to grazing so that’s why all of a sudden we’re seeing signs of deer and why I make such an assumption about their health. If you look closely at the pic, you’ll spot the berries. In past years we’ve had guys come by and ask for permission to pick them. Last year they – the pickers – were getting $.85 per pound. This year the deer are picking us clean. We lost power this morning for a couple of hours. Turns out the power company is doing a large scale tree trimming in the area and somebody dropped a branch on the power line down the road. That caused a major disruption for Nancy because today’s her quilt group meeting and with no power, no hair dryer. It ended well because they restored power with time to spare and with a silver lining. As the tree trimmers create piles of brush,the last truck is a chipper truck and converts it all into mulch. We asked them if they would mind just piling all the chipped brush off onto George’s property. It yielded 3 truckloads, probably 15 yards per load. The pic shows the first load so multiply that by three. I’ll be able to completely cover all the newly filled areas with this tree mulch and thereby eliminate the problem I now have with dirt on my shoes. Nancy will be such a happy camper. I have to break out the wheel barrow again and spend a few days hauling and spreading. The mulch is lighter than the dirt so loading it will be easier but the pile is about 1000’ from the spread point so much more walking involved. Ironic, isn’t it, that a few days back I’m thinking that it’s the end of my chip days and now I have a multi-year backlog. At this point I’m wondering what gives out first, the wheelbarrow or me. The reason Obama is getting nowhere with Congress is that he lost all credibility in terms of negotiating when he was rolled by Putin and Assad.